Built in 1958, 1217 Main Street in Dallas, TX is a mid-century modern commercial building that originally served as a bank and also housed office space. In the early 2000s, the brick building had reached the end of its lifespan and underwent a complete renovation to reflect its new occupants: a nightclub and a restaurant. It wasn’t until 2017 that construction began on 5G Studio Collaborative’s latest revamp of the 28,000 sq. 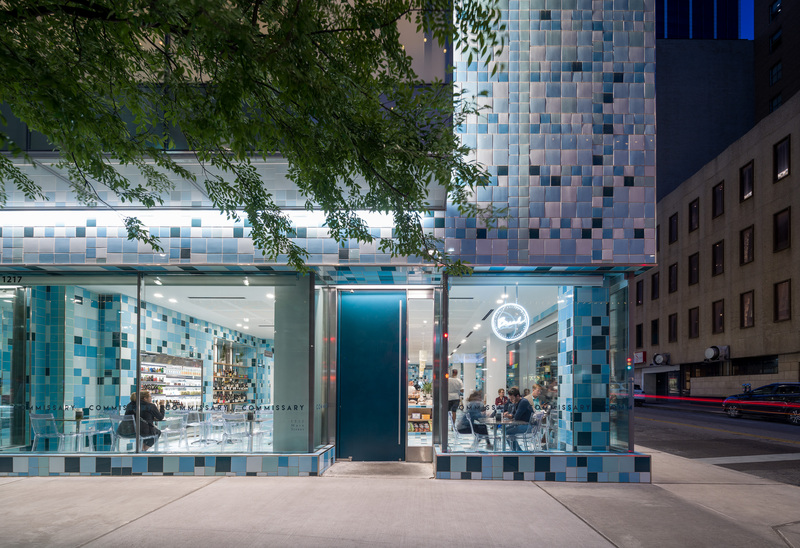 ft. site, which included the addition of a fifth story, an innovative rainscreen facade featuring ceramic tiles in varying shades of blue, and Ellison Bronze custom balanced doors; including one formed-up, solid aluminum door painted to complement the aesthetic of the exterior “mosaic” of ceramic tiles. The 4’ x 10’ aluminum Ellison balanced door, painted teal, is located at the entrance of Commissary on the ground floor. 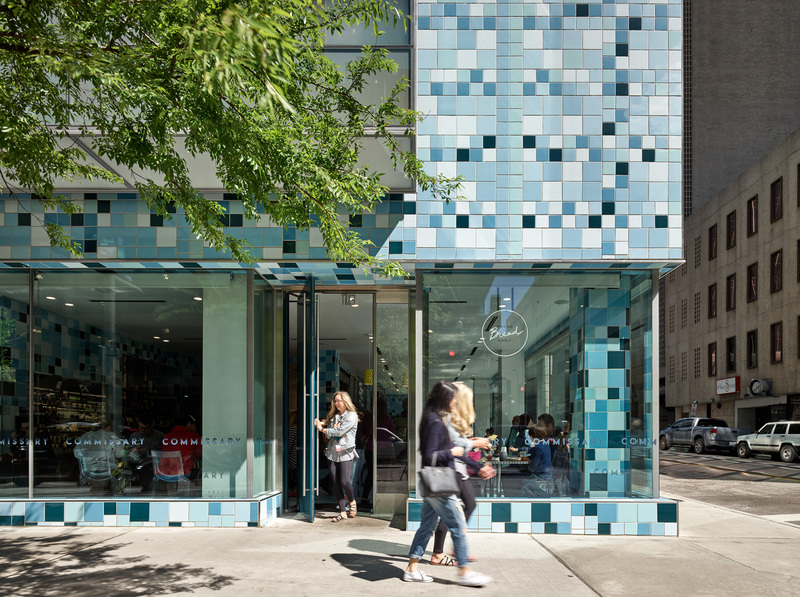 Commissary, “a bakery, butcher shop, gelateria, espresso bar, and market,” is a modern go-to in downtown Dallas—morning, afternoon, and night. In addition to serving meals of their own at 1217 Main, Commissary operates as a prep kitchen for other restaurants in the area — preparing pastas, breads, meats, and bakery items daily for a number of local eateries. Ellison supplied two additional single balanced doors for 1217 Main Street that give access to offices spaces located on floors two through five. These narrow stile, tempered glass doors are factory-glazed with ¾-in. ultra-clear tempered glass. All three doors, including the Commissary entrance, feature a stainless steel sidelight. The basement and ground floor of 1217 Main Street are occupied by a butchery and the Commissary restaurant, the 2nd floor is an interior design firm, and floors 3-5 are occupied by the architects themselves, offices home to 5G Studio Collaborative. 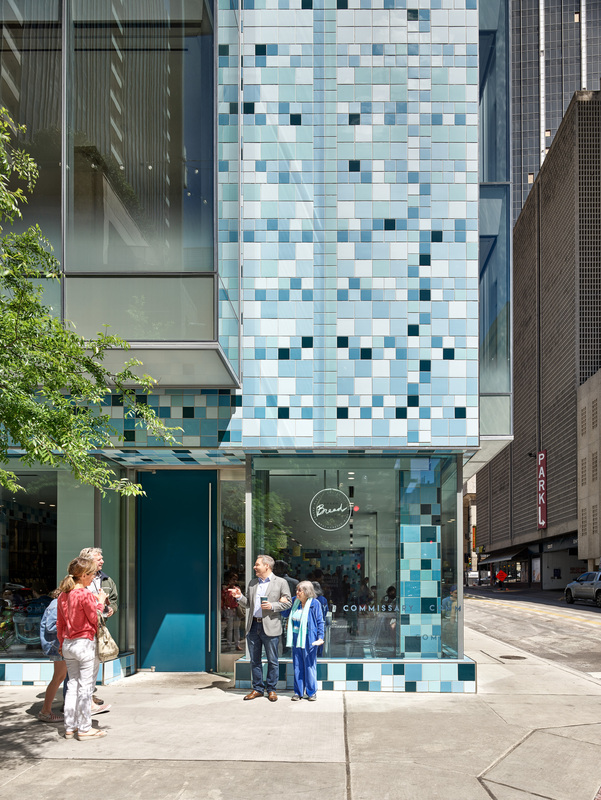 The inventive tile facade and rainscreen attachment system were designed and created by 5G Studio in collaboration with Cuban-American artist, Jorge Pardo, famous for his fusion of art, sculpture, and architecture. 5G worked alongside tile manufacturer, Cerámica Suro, to “develop a tile with properties closer to porcelain,” according to 5G Studio. 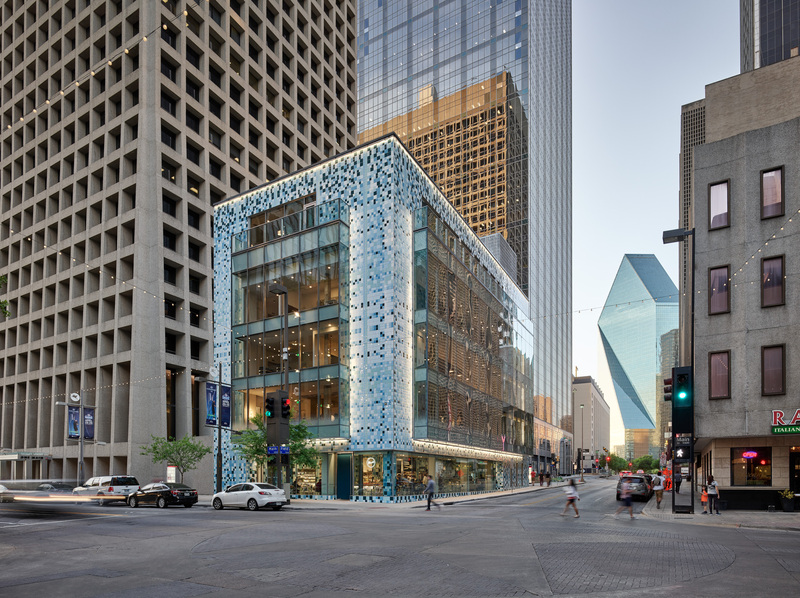 A challenge presented by the climate required a ceramic tile with a lower water-absorption rate that would not flake or crack through Dallas’ yearly weather cycles. The entrances are designed to last too, because Ellison doors and frames are formed and welded using durable sheet materials that give them a rigid, unitized structure. The balanced hardware featured on all Ellison doors allows them to outlast standard entrance systems and successfully supports the heavy and durable materials used to construct the doors. They are also much easier to operate, even on the windiest days, which is especially beneficial in areas of steady foot traffic. As a result of the pivot point located at two-thirds width, swing projection is reduced, allowing pedestrian foot traffic to flow smoothly. Ellison provides detailed record keeping and full warranties on each door they manufacture, which is important when considering their extensive lifespan. Every door made is imprinted with an individual project number to facilitate easy tracking and maintenance. In addition, all Ellison balanced hardware components are machined in-house, so replacements are readily available upon request. Quality control and performance are paramount at Ellison Bronze which is why each door including all balance hardware mechanisms—are cast, crafted, formed, and uniquely construction from the finest choice of materials at Ellison’s ISO 9001:2015-certified facility in Falconer, NY. 1217 Main Street was completed in December 2017. 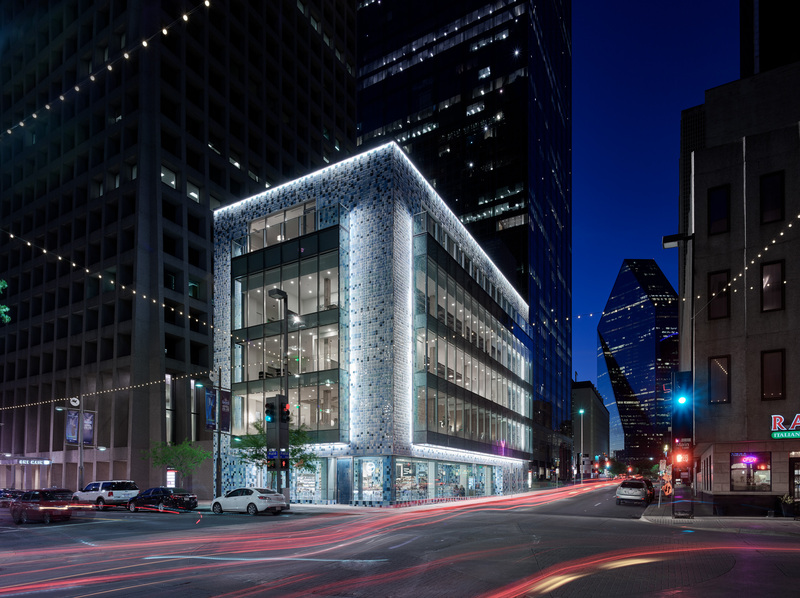 In addition to Ellison Bronze, the project team included architect 5G Studio Collaborative; structural engineer Armstrong-Douglass; tile manufacturer Cerámica Suro; facade installers TST Construction Services and Ramon Franklin; facade consultants Studio NYL; and artist Jorge Pardo.